Luckily, it’s finally cooling down! I love the Fall because it gets colder, which means my kitties snuggle with me even more for warmth. I want to celebrate this favorite season with my furry friends by pampering and spoiling them with tons of their favorite treats and gifts. I love shopping at 99 Cents Only because I save so much money as compared to other stores and find so many great deals. What this means is that I can buy little little furries even more goodies! I live in walking distance from the 99 Cents Only in my neighborhood and I shop there all the time for all kinds of household supplies. They have a little bit of everything! I find such incredible deals there and save so much money on everyday products. As a travel writer, I’m often on a budget so it's good to save money wherever I can. Shopping at the 99 helps me stay well within my budget at all times. I hate overspending at other stores, that’s why I’m at the 99 almost weekly. I’m so glad that I live right next to one so I can indulge in being the 99'er that I am. I can get everything I need to keep my kitties happy at the 99. The deals there are so incredible and you know I love a good bargain! I love to spoil those little critters, they are the little lights of my life. 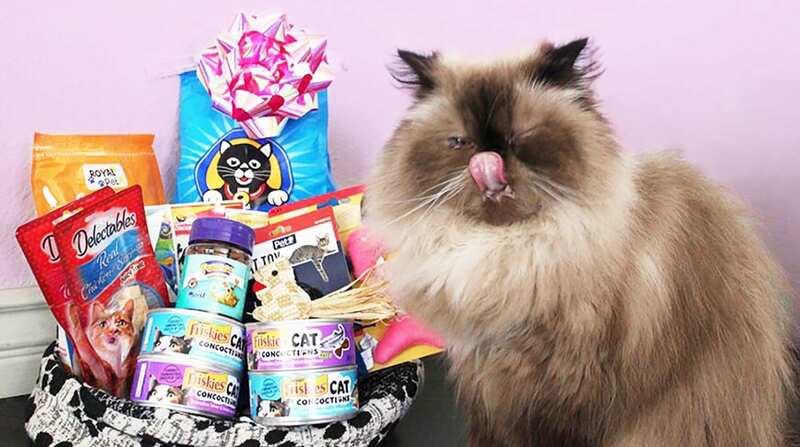 Check out the selection of cat treats and supplies at my local 99 Cents Only store! Btw the 99 has delicious, fresh and healthy produce at incredible prices. I’d 99 that! But seriously, sometimes it's actually way more expensive to eat healthy. But not at the 99! 99 Cents Only Stores carry tons of name brand products at the most affordable prices ever. There’s new stuff being brought in every single day. I love shopping there because I never know what exciting new thing I’ll find. So…. I was shopping for my kitties at the 99 but I was SO distracted by the Halloween selection. It was pretty mind blowing and I am planning on throwing a Halloween party my friends just to take advantage of all the killer creepy stuff they have. Check out some of their selection. (I didn’t capture all the Halloween goodies available, I would have needed to shoot 10-20 photos to cover everything Halloween that was in store! No need to purchase an expensive kitty tree house for your cat! I buy tons of stuff online so whenever I’m done with my cardboard boxes I’ll lay them around for a couple of days so the kitties can explore and examine them thoroughly. Hammy the Himalayan also adores sitting in plastic or paper bags so whenever I get takeout, he also gets a special treat! A great way to pamper your cat on a budget is to give them treats. I always have some treats on hand for my precious friends. Cat treats can get pricey, especially if you have greedy kitties like mine. 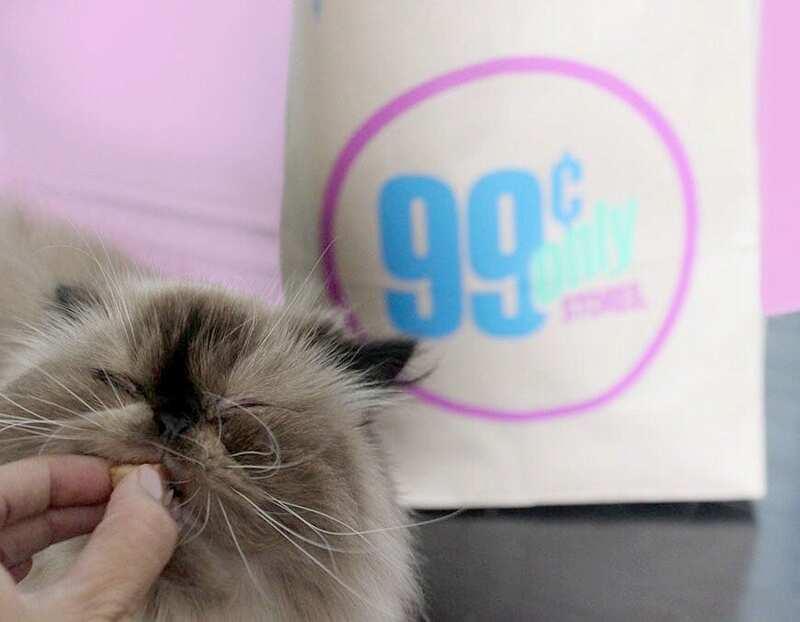 Shopping at the 99 definitely saves me a pretty penny. I bought these treats here for 99 cents, they cost at least $1.50 anywhere else. Cats can sleep anywhere, they can naturally padded with fur but they definitely enjoy a comfy bed just as much as we do. Cat beds usually start at about $15 at the very least and go way up from there. 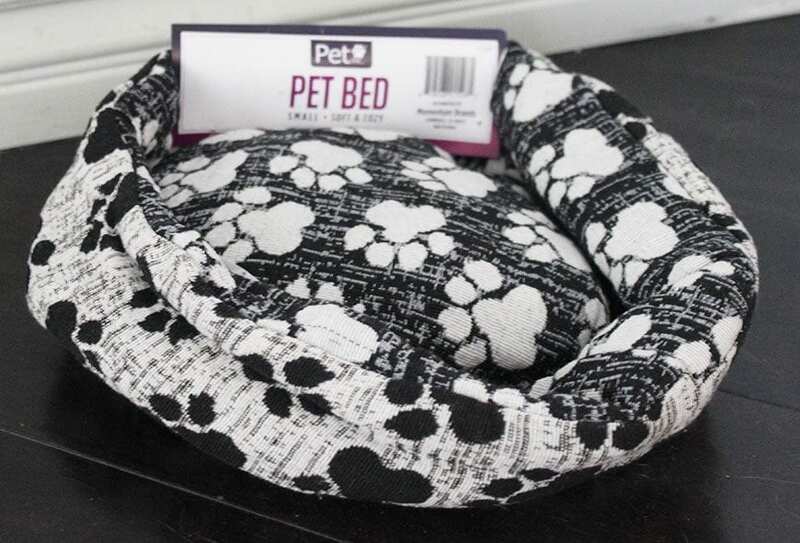 I picked up this amazing cat bed from the 99 for just 1.99!! What an incredible deal and its padded inside for added comfort. A quick and easy toy to make for your kitty is to take a old sock, fill it up with catnip and then tie a knot in it! Kitties love this! Otherwise, just go to the 99 and pick up a couple toys. Here are the ones that I grabbed for just 99 cents a piece. I definitely would have paid at least 50% more shopping anywhere else. Just pick up a flower pot (hint you can find one at the 99), fill it with some soil and kitty grass seeds. My oldest cat Kitty absolutely loves Kitty grass, she eats it every single day! It’s amazing how much my cats appreciate a good ol’ toilet paper roll. There’s nothing to it, once you are done with a roll of paper, just throw them your cardboard roll and they’ll get a great playtime out of it! I have a little bird feeder outside of my window so that my furry friends can watch their very own live television show to their hearts delight! I get my very own show also, the kitties almost can’t contain their own excitement and they’ll chirp and chortle and make all kinds of funny sounds and dance around. Another option is sometimes I’ll play a Youtube video made for cats, featuring squirrels, bunnies and birds, they love that too! Really the best way that you can spoil your cats is to give them some one on one play time. You don’t even really need any toys to play with your kitties. Sometimes I’ll chase them around and play hide and seek. Or they especially love to chase my feet as I move them around under the covers. Another way to spoil your cats is to give them tons of cuddles. Talk to them, pet them, snuggle them. So that’s how I spoil my cats rotten at the 99. How do you do the 99?